Are digital solutions good for farmers? We crossed a few fields and traveled a fragmented and dusty road to arrive at Jalala village, our second location for our field visit (link to previous blog). 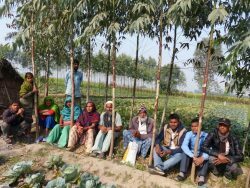 Jalala village is in the Nepalganj region of Nepal’s Terai plains and home to the first group of farmers we consulted (14 in total). We wanted to make sure Feed the Future’s Data-Driven Farming Prize addressed their needs by hearing first-hand accounts of their daily lives and experiences. For many traditional Nepali families in Jalala, the day starts with an early wake up call, morning prayers, and a quick snack before starting work. Most men go into the fields, while women generally send the children to school (when it is too expensive to send all the children to school, young girls help on the farm, while boys attend school), and cook. Around 11 in the morning, families come together to eat lunch and work: men usually continue to plough and till while women weed and seed the fields. 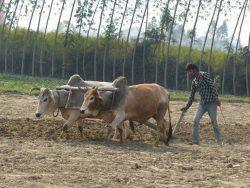 Resources are scarce and farmers use manual techniques that are time–consuming and require heavy lifting. After ten hours in the fields, the family returns home to eat dinner. uncertain and faces threats from natural disasters, drought, market fluctuations and market inaccessibility. 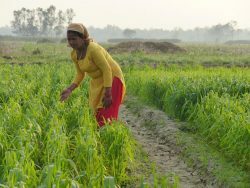 Farmers aspire to have growing and more stable steadier streams of income, and families struggle to pay annual fees to lease a plot (about 50,000 Nepali rupees, or nearly $470 U.S. dollars). Regular expenses are exacerbated by unreliable yields, spoilage, and weak, inconsistent markets for their crops. Many of the farming families we spoke with expressed a need for better tools to manage this uncertainty and plan for the future. At first, it was unclear how digital solutions might solve these problems. Yet when we started exploring the needs farmers wanted to address, we learned that there was a big thirst for reliable and actionable agricultural knowledge. “We don’t know how to identify and treat diseases, how to use pesticides. We need to know how to make better use of our resources, what to farm, and when.” Apaiman, a mother of six, explained. “We need to be alerted to the new technologies that can help us, and how we might bring our products to the market. We also need to know market prices for our crops,” added Sadamsa, a father of eight. Information is currently shared informally. “We share information and knowledge between families and friends. Sometimes we get tips from agribusiness. It’s okay, but we need to know more about how to tackle droughts or improve irrigation techniques, for instance,” explained Milty, a father of nine. 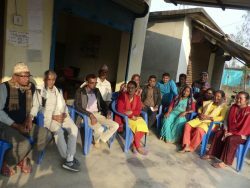 These concerns and requests for better information were repeated later in the afternoon when we met with a group of 15 farmers from the Suryoday Farmer’s Cooperative. 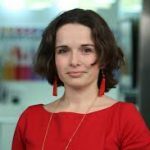 The cooperative is four years old and aims to connect farmers with agricultural information and solutions. Here, the voices were even more unanimous on a specific point—farmers want to increase their productivity, learn how to grow higher-value crops, and understand the different types of agricultural input products available to them. This information needs to be accurate, relevant, and tailored to their context. Most farmers don’t use smartphones, and many of them—the majority of whom are women—are illiterate. Therefore, information for farmers should be delivered as a mix of audio-visual and some textual content in Nepali, for those who can read. When we suggested a sensored tractor that could collect and share data to improve techniques on the field, the group thought the idea was “great” and seemed to think “we found the solution.” In response to our questions, we learned that the most useful digital technology would be hardware that could sense and provide information that directs practical activities, as opposed to applications they cannot access. Information is an incredibly important resource. Our field visits in Nepal emphasized how vital it is to use information that can generate stronger connections between farmers, markets and consumers; to ensure that farmers can gain profit from their products, agricultural production remains fresh from farm to market, and there is culturally relevant and gender sensitive training for farmers. While farmers need tractors, new irrigation technologies and other types of hardware, knowing what to plant and when, how to address disease, and how to maximize the sale of a product are also paramount. Any information-sharing solution must be timely, context-specific and respond to the daily lives, skills, and habits of farmers. The Data-Driven Farming Prize is supported by Feed the Future, America’s global hunger and food security initiative.